Of all the high-quality French mantel and table clocks in R.O. 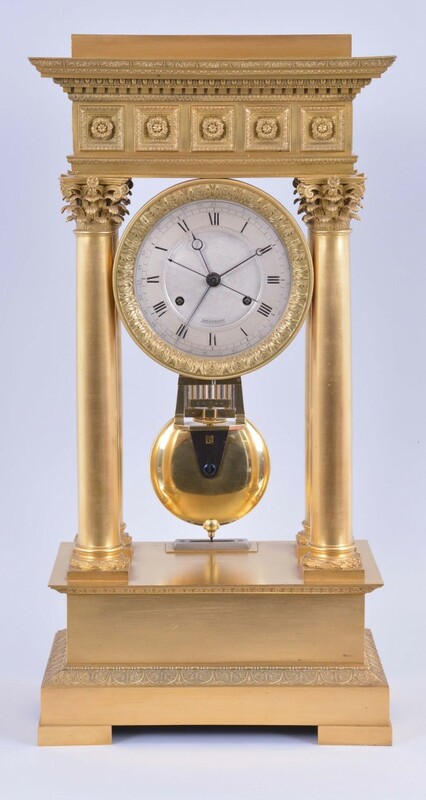 Schmitt Fine Arts’ annual spring horological and antiques auction , slated for April 29th and 30th at the Radisson Hotel in Manchester, N.H., one of the more intriguing is the Charles X mantel regulator by Deltroit you see pictured here, housed in a monumental, gilt bronze portico-style case. The clock’s back plate is signed “Deltroit Eleve de Janvier”, indicating Deltroit studied under the celebrated clockmaker Antide Janvier. To see the clock in a video, visit https://youtu.be/4R45ArGbjFs. The two-day, two-session auction will feature a wide selection of horological material for collectors, dealers and those involved in timepiece repair and restoration. Included will be many fine American and European clocks and watches, as well as jewelry, music boxes, phonographs, glassware, silver, horological books, tools and more. The complete auction catalog has been posted online and may be viewed in its entirety at www.roschmitt.com. Videos of a few of the more interesting items can be seen on the R.O. Schmitt YouTube channel. Antique beer steins and other drinking vessels are hugely popular with collectors, and Fox Auctions holds five online-only auctions a year dedicated entirely to that one category, with each sale usually featuring 500 lots. The April 28th auction will contain 35 regimental beer steins, the gorgeous and highly detailed steins that came into fashion in Germany when Kaiser Wilhelm II expanded the country’s military system, beginning in 1888. The steins captured the spirit of Germany’s Armed Forces and were prized by their owners. Today they’re prized by collectors. An example of what is in the sale is the stein you see here, a regimental military stein showing a zeppelin scene on both sides. That meant the soldier who owned it was an airport worker, since a stein’s design was an indicator of the job he performed in service. 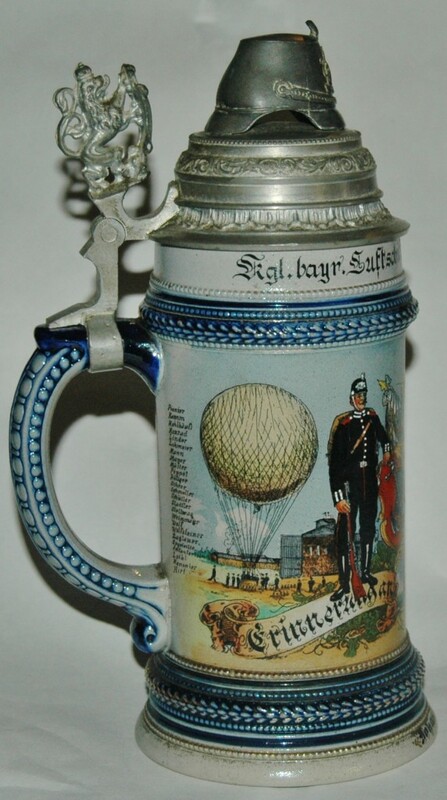 Considering this stein was made around 1900 or before, when zeppelins were uncommon, means not many of these were made, and that will drive up the price. Also, the finial of the stein is a helmet. Such decorations were costly. Looking for something truly spectacular to give to Mom or a loved one on Mother’s Day? Your search has ended. 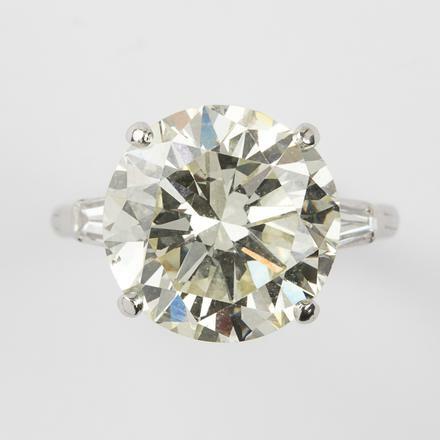 You’re looking at it: this gorgeous platinum and diamond ring, lot #22 in Gray’s Auctioneers’ Important Jewelry Auction, being held Wednesday, May 10th, online and in the firm’s gallery at 10717 Detroit Avenue in Cleveland, Ohio. The ring is a whopper by any measure, with a round brilliant cut diamond weighing a staggering 8.60 carats, having L color and SI-1 clarity. The estimate? A cool $80,000-$120,000. Of course, not everything in the auction will set you back six figures. The lot right before this one, lot #21, is a 14kt white gold and diamond ring set with a cushion brilliant cut diamond weighing a mere 2.76 carats. It’s expected to bring $20,000-$40,000. The 99-lot auction, which will begin promptly at 11 am Eastern time, is packed with all manner of jewelry items certain to please any mother or significant other, starting at price points that are a little more wallet-friendly than the two items described. Happy Mother’s Day! Four days before Gray’s auction, on Saturday, May 6th, Gulfcoast Coin & Jewelry will conduct a Mother’s Day Multi-Estate Jewelry & Collectibles Auction, featuring over 500 lots, online and at the firm’s gallery in Fort Myers, Fla., at 12 o’clock noon Eastern time. 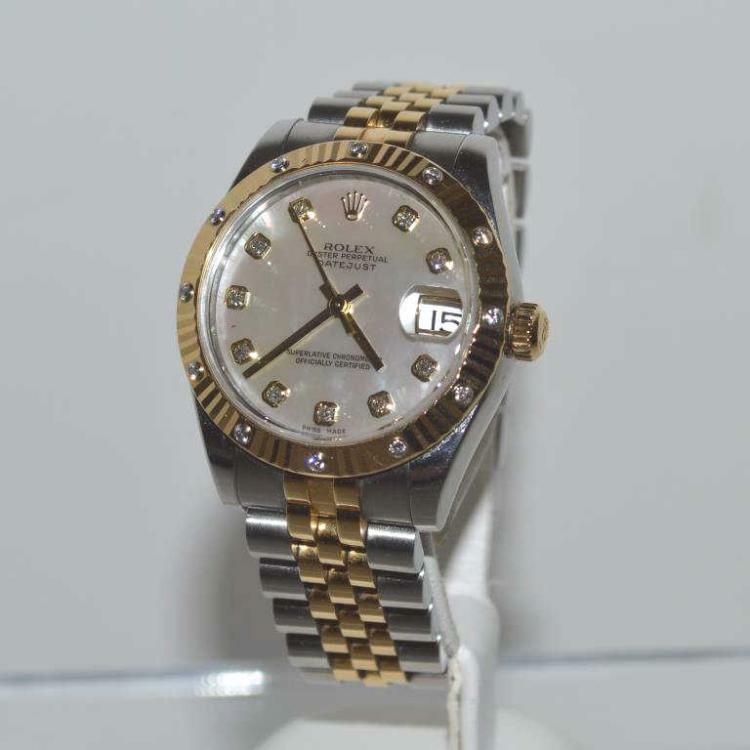 A fabulous gift idea for Mom or other loved one would be this beautiful ladies’ two-tone 18kt and stainless steel Rolex Datejust watch, with a mother of pearl diamond dial, fluted diamond bezel, jubilee bracelet and sapphire crystal. It’s lot #111C (est. $10,000-$12,000).